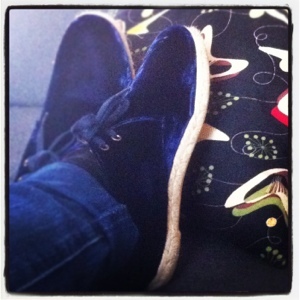 It’s hard to wear blue velvet shoes without spending all day singing the Tony Bennett song by the same name. Or having an overwhelming urge to watch some David Lynch. These lovely desert boots with espadrille sole are by Penelope Chilvers. They’re super-cute, comfortable and make me feel like a particularly dandy mod. Not a bad Friday feeling!